Emily received her undergraduate degree at the University of Illinois at Urbana-Champaign and her law degree at DePaul University College of Law. 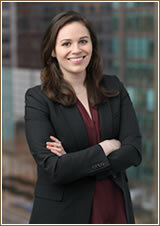 While at DePaul, Emily was a recipient of a family law fellowship from Schiller DuCanto & Fleck, LLP Family Law Center. Emily was also awarded an internship at the Cook County Office of the Public Guardian, where she assisted in the representation of children with parents involved in contentious dissolution proceedings. While in law school, Emily also participated in DePaul University’s Family Law Clinic, where she used her 711 law student license to reach favorable outcomes for clients in both dissolution of marriage and domestic violence proceedings. Prior to joining Griffin McCarthy & Rice, LLP Emily worked as a law clerk at another boutique family law firm and held a judicial externship with the Honorable Jeanne Cleveland-Bernstein in the domestic relations division of the Circuit Court of Cook County. Emily is committed to avid representation of her clients, recognizing that each client brings along unique circumstances and goals.